1).The horizontal swing of the top of the moving jaw is about 1.5 times of the lower part and the vertical swing is smaller than the lower part. The vertical swing of the whole moving jaw is about 2~3 times of the horizontal swing. 2).The bulk material is easily pulverized in the upper part, and the whole raft is evenly applied, which is beneficial to the improvement of the production capacity, which is 20~30% higher than the simple pendulum smashing machine. 3).The broken products are mostly cubic blocks, which reduce the appearance of sheet products. 4).With mandatory discharge, it can be used to crush some slightly wet materials. 5).There have been smashing phenomena, increasing production energy consumption, dust is large, the slab is easy to wear, and the force on the eccentric shaft is large. 6).The structure is simple and compact, generally medium and small. 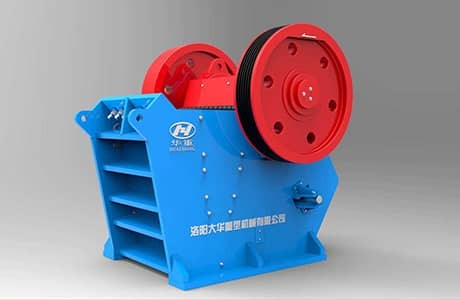 1).Regardless of the top or bottom of the moving jaw, the movement is beneficial to the clamping and breaking of the material during the stroke of the fixed amount, and pushes the materials to the outlet, thus improving the discharge conditions and improving the production capacity of the crusher. 2).The ratio of the horizontal swing to the vertical swing at the bottom of the moving jaw is 1:0.8, which is more reasonable than the compound swinging machine, which can reduce the wear of the working parts. 3).Since the moving jaw and the connecting rod are suspended on the eccentric shaft, the eccentric shaft and its bearing are weakened and easily damaged. 4).The structure is more complicated and only suitable for manufacturing minicomputers.